This study used concept mapping, a research method for exploring a new concept or one that is not currently well-understood. The concept we wanted to explore was: culturally safe primary care for people who use or used substances. Our aim was to map out this concept – what it means, what it entails, and how it can be achieved, all from the perspective of people who have been there. Concept mapping involves a number of steps. Flow of concept mapping and focus group activities. To prepare, we (the research team) chose a focus prompt, or statement to use to help participants describe cultural safety. In this study we used the statement “I would feel safe going to the doctor if…” In focus groups, 68 participants brainstormed answers to complete this statement. After these groups, we had over 700 statements, which we collapsed down to 73 unique ideas. In a second round of focus groups, participants sorted the statements into groups of similar ideas. These data were entered into a computer program which produced a colored map of clusters of statements that were paired together most often. Then, in the third round of focus groups, participants identified the key ideas represented in each cluster of statements. They also rated each statement based on how important it was on a scale from 1 (not important) to 5 (very important). Most (79.4%) of the 68 participants came to all 3 groups; 7 new participants were also added over time, such that we spoke to 75 participants over the course of this project. The research team then came up with the final names for each cluster of statements. This gives us a preliminary working of model of culturally safe primary care for people who use or used substances. In next steps, the research team will collaborate with doctors, other health care providers, health planners, and others to share these findings and work on ways to put them into practice. Labelled cluster map created using Concept Systems Software. Hey I’m human. Treat me right! 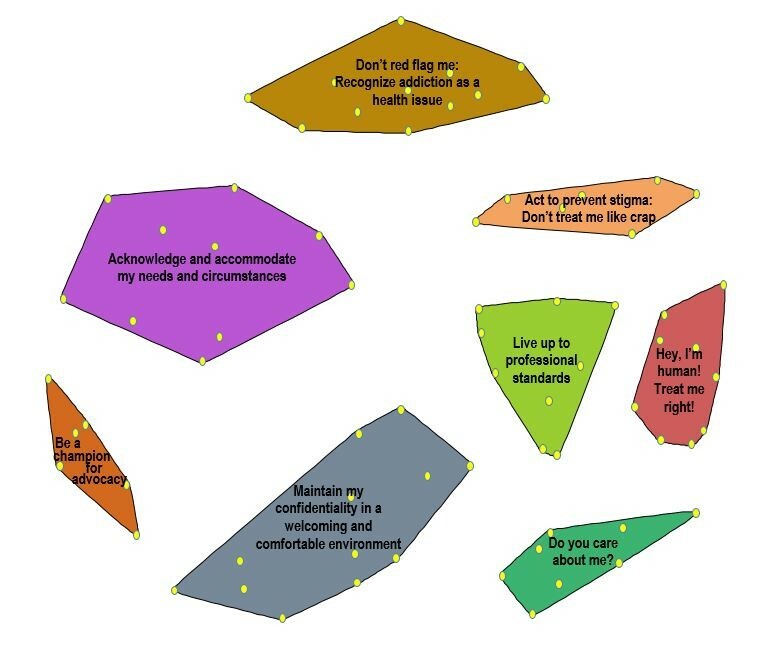 This cluster was made up of statements reflecting the need for physicians and their office staff to treat patients with respect, dignity and compassion. In particular, participants reported they did not want to be turned away or refused care because of their past or present substance use. Within this cluster, the statements reflect the idea that doctors should clearly communicate with patients and allow patients to have a role in planning the care they receive. In particular, participants want a doctor that is knowledgeable about addiction and who helps to manage pain and medications. Act to prevent stigma: Don’t treat me like crap! This cluster focuses on receiving care that is free of stigma, judgement or labelling as a result of one’s substance use. Instead of judging and labelling, the participants expressed wanting to receive care that is sensitive and empathetic towards people who use substances and helps to address their health concerns regardless. Participants identified wanting to receive care from the same physician at every visit and wanting to feel like the physician does not rush the visit to get through more appointments. In addition, the statements in this cluster indicate that people want options other than medication. In this cluster, participants identified the waiting room as one area of primary care that can be improved by having friendly staff, comfortable and open waiting areas, allowing people to access their medical records, and by ensuring health concerns remain confidential between the doctor and the patient. The statements in this cluster focused on the desire for doctors to view addiction as a legitimate health concern, not a criminal behavior. This means doctors should know about local resources ranging from abstinence-based to harm reduction services. This cluster also addressed the idea that people should not be red-flagged by the health system. This cluster looks at the circumstances many people face that impact their health including gender, race, and poverty. The statements in this cluster state that doctors should be accommodating of these and other circumstances to ensure everyone is able to access care by not charging for missed appointments, getting consent for care, and not taking people’s children away because of their substance use. The statements within this cluster focus on reducing the anxiety people may feel about accessing care by allowing people to bring an advocate or friend with them to appointments, having doctors that are the same gender, and providing care in accessible locations.